At least 650 million people globally are affected by some kind of disability; one quarter of all citizens in developed countries are 60 or older and, by 2050, most developing countries will have caught up. Accessibility is increasingly an issue as the world population ages and people with disabilities demand equal access to social, political and economic life. For them, as well as for the able-bodied, access to information and communication is as important as is the ability to use an elevator, enter a building, travel, or safely turn on and use a device. But accessibility is not only an issue for the elderly or disabled. Anybody at any stage in life can experience temporarily reduced accessibility. When that happens, simple, everyday activities can become very complicated. International standards give manufacturers and service providers the guidelines on how to design products accessible for all. The little dot on the number 5 on a phone keypad makes it easier to find numbers ñ a boon in the first days after an eye operation. 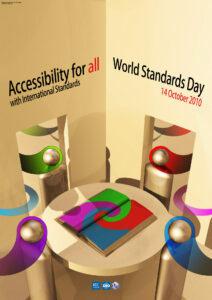 International standards facilitate everybodyís access to products, structures and services. They include safety considerations, ergonomics and harmonized test methods all geared to increase accessibility. Standards also provide a platform for the dissemination of technological innovations both in developed and developing countries. They help markets to grow faster and increase global trade. IEC, ISO and ITU coordinate their work and offer a system of standardization that helps designers, manufacturers and policy makers to make the world safer and more accessible for all, today and tomorrow.